A ridge of high-pressure which has been dominating Aotearoa this week is set to give way to a front this Easter weekend. MetService is forecasting a front to reach the South Island tomorrow before moving northwards towards the North Island late Saturday, this means the North Island should see a settled start to the long weekend. By Easter Sunday the front will start affecting the western and southern parts of the North Island which is not good news for planned Easter egg hunts. “The inclement weather for Sunday morning will include much of the east coast of the South Island and the west coast of the North Island from Taranaki to Wellington, as well as Wairarapa,” explains Lee. As Sunday end, much of the North Island will be in line to see some wet weather and this trend continues into Monday when a low pressure associated with the front affects the Island. “There could be potential for some heavier and thundery showers on Easter Monday which might not be welcome for anyone planning on driving home in the North Island that day,” continues Lee. 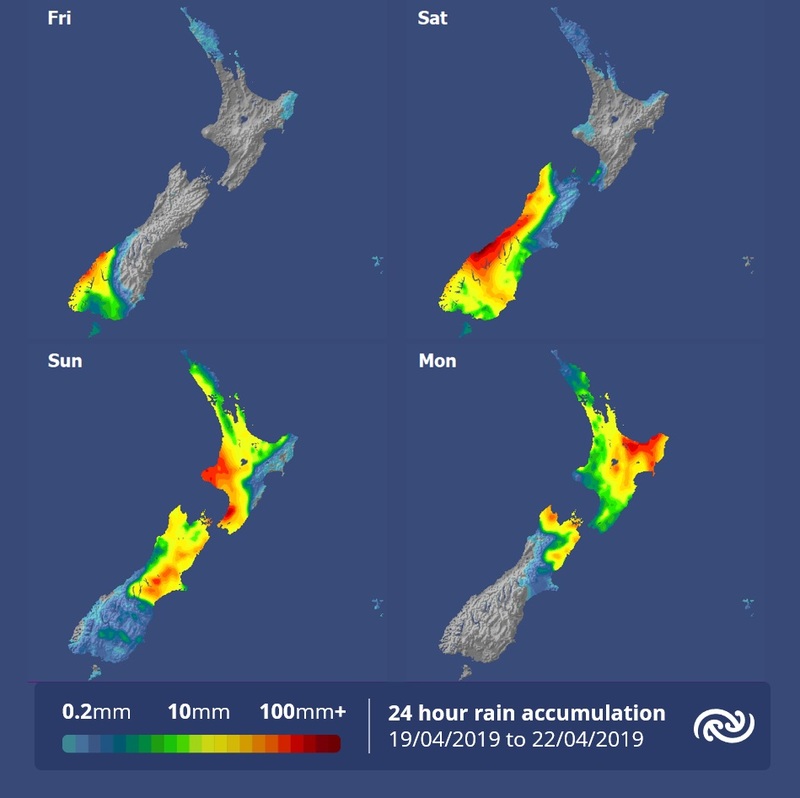 At this stage there is uncertainty with the timing and exact location of any impactful weather, so it is important to keep up to date with the latest forecasts as well as any Severe Weather Watches or Warnings MetService will issue during the weekend. On Monday, the South Island will see the benefit of another high-pressure system bringing settled weather back for most of its residents apart from the north and northeast coasts.